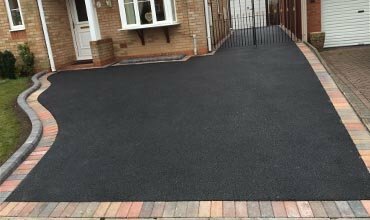 The Benefits of Tarmac Driveways | Why Choose Tarmac? What are the benefits of having a tarmac driveway? Tarmac driveways are cost effective, more cost effective than concrete. Besides it’s cost efficiency you can also receive a quicker turn around of job completion as it takes less time to install a tarmac driveway when compared to other driveway solutions saving both time and money. Tarmac is quick drying meaning you don’t have to wait long to use the driveway to park your vehicle. Tarmac is highly weather resistant and can survive anything from storms to hail and ice. The tarmac is also highly durable when parking large vehicles and the smooth finish of the driveway provides skid resistance. This skid resistance also helps to accumulation less snow and ice. Tarmac driveways installed with block paving perimeters offer a sophisticated appearance. Tarmac is even better than concrete for recycling as it can be used infinitely. It can be used literally over and over again, without losing a single piece. This is great news for the environmentally conscious among us. Construction of a tarmac driveway helps to preserve natural resources. Unlike other materials, tarmac doesn’t run into waterways. When looking for a tarmac driveway company you need to be sure they are experienced and have the relevant qualifications to perform the work, the wrong people for the job can leave you in a heap of trouble.